Corruption has been a persistent problem in Italy, with the country receiving one of the lowest scores of EU member states in Transparency International’s latest ‘Corruption Perceptions Index’. Andrea Lorenzo Capussela and Vito Intini provide a comprehensive look at the problem, noting that on several measures corruption has increased since the late 1990s. They argue that corruption in Italy represents a ‘resilient equilibrium’, whereby the political system provides little incentive for parties to tackle the problem. They suggest that external pressure from other countries in the EU may offer one route to breaking this cycle. That corruption is widespread in Italy is well established, as are its harmful effects on public finances, SMEs, the quality of public investments, productivity, and trust in the country’s institutions. This in turn tends to increase informality in the economy, which, in a vicious circle, will tend to keep corruption at high levels. 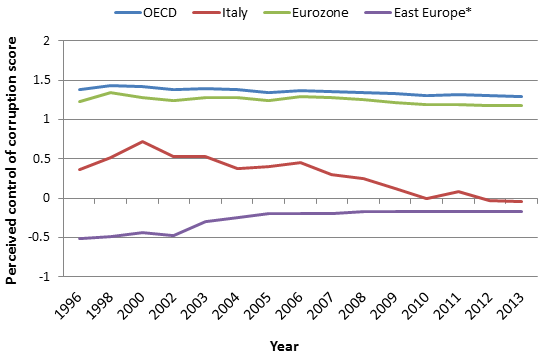 Nadia Fiorino, Emma Galli and Ilaria Petrarca have shown that corruption in Italy is negatively correlated with economic growth for the period 1980-2004. According to Fabio Monteduro, if Italy had corruption scores similar to those of the relatively more virtuous countries, its economy would have grown two to three times faster. 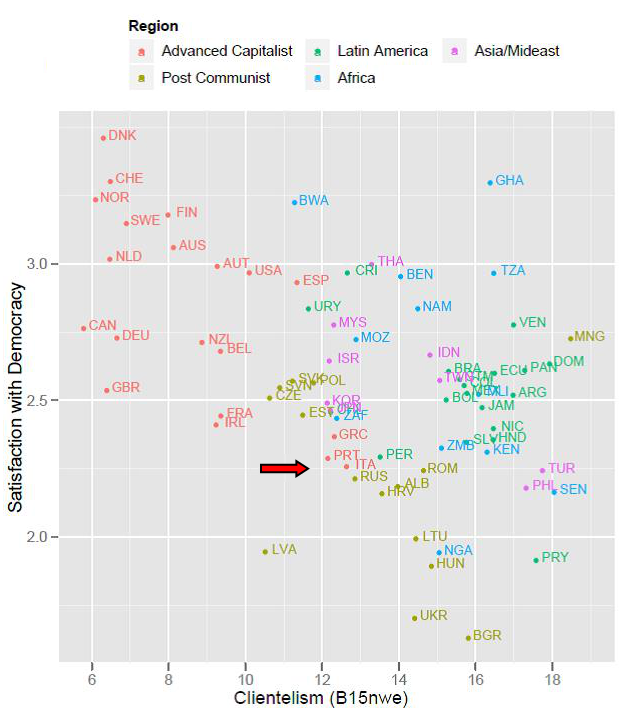 In addition, as Figure 1 indicates, citizens tend to show a lower level of satisfaction with democracy in countries where parties rely more heavily on clientelistic strategies. Indeed, contrary to conventional wisdom, corruption in Italy does not seem to be a cultural issue. 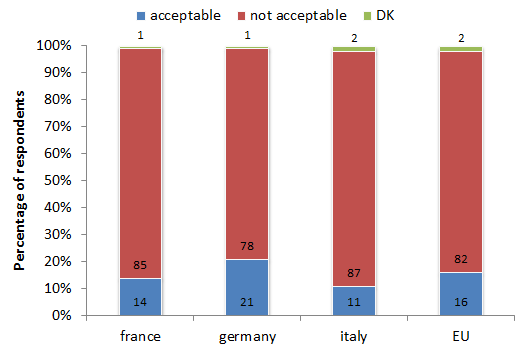 According to the latest survey by Eurobarometer, shown in Figure 2 below, Italian respondents are consistently below the EU average in deeming corrupt practices acceptable. A similar pattern emerges from an indicator of ‘civicness’ such as election turnout. 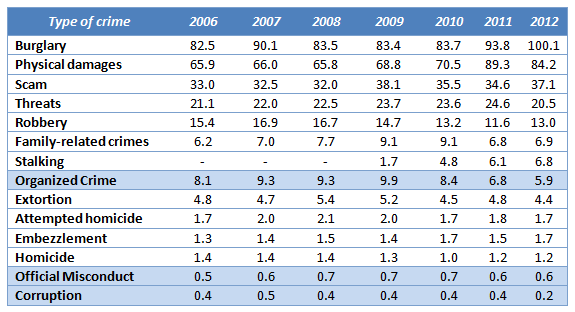 In fact, turnout in Italy has constantly been high for national, local, and European elections. 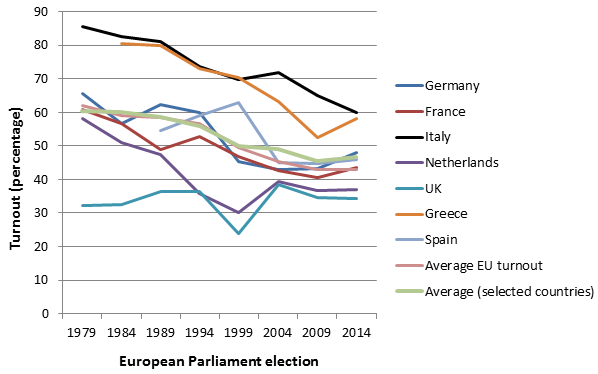 In Figure 3 we just show trends for the European Parliament, as these elections have historically been less influenced by voters’ attribution of blame for their socio-economic conditions and, consequently, more likely to serve as an indicator of ‘civicness’. Although all countries’ trends are negative, Italy’s turnout still stands out. 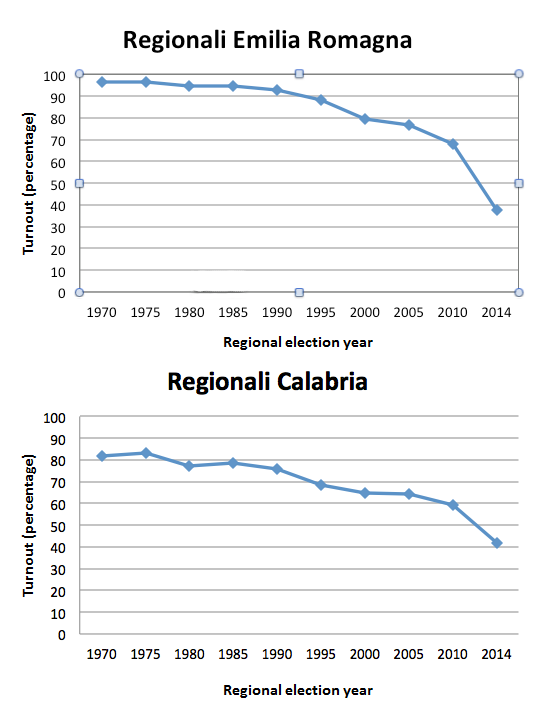 When comparing two Italian regions normally viewed as opposite extremes in terms of social capital (Emilia Romagna and Calabria), we can see that their trends in voter turnout in regional elections have both been negative, with Emilia Romagna showing an accelerating trend in Figure 4. 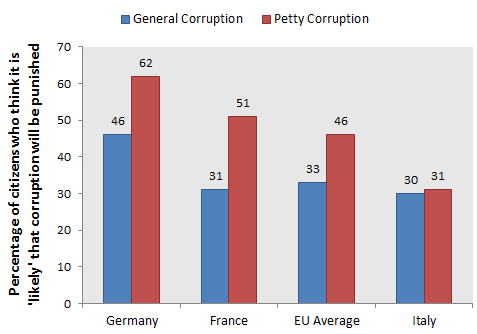 If the diffusion of corruption is well established, however, less well known is that Italy exhibits remarkably weak determination in fighting it. And why this is so is as unsettling a question as it is underexplored. Our tentative answer is based on the hypothesis that the diffusion of corruption – which we define, broadly, as the use of public office for private gain – is an equilibrium outcome. Indeed, based on the literature that originated from Seymour Martin Lipset, any rational person when pondering whether to offer (or accept) a bribe or not makes a cost-benefit analysis, which includes the cost of being caught and punished and the benefit of corruption. The latter depends on, first, a large public administration with relatively low-paid civil servants; second, a highly regulated public sector; third, fast-changing legislation; fourth, a lack of firewalls between politics and businesses; fifth, low social cohesion or social and political fragmentation, and economic inequality; sixth, oligopolistic markets; and finally amoral familism. This analysis in turn depends on the level of effectiveness of the judicial system and the special protection treatment provided to those who report such cases. We argue that Italy carries most of the above-mentioned characteristics that tip the balance towards the benefit side. Moreover, one additional point could be that in the 1990s there has been a sudden retrenchment of the public sector, which, following the same logic that obtained in the former socialist bloc, has given rise to more cases of corruption linked to privatisation and a shrinking fiscal space. As Figure 5 below, shows, the percentage of citizens in Italy who think it is likely that corruption will be punished is lower than the EU average for both general and petty corruption. On the cost side of the analysis, the judicial system in Italy is characterised by relatively limited (financial and human) resources and inefficiencies, as the tables in Figure 6 show below. As a result of the inefficiencies of the judicial system, among other factors, the intensity of corruption-related crimes reported to the authority are the lowest of all types of crimes. Official data published by the national statistical office shows that the number of convictions per year declined by a factor of 14 between 1996 and 2012. As a result, in 2010 Italy and Finland – the third least corrupt country in the world, according to Transparency International’s latest data, and the second ‘cleanest’ in Europe – opened the same number of corruption investigations, in per-capita terms (0.4 per 100,000 inhabitants, as Alberto Vannucci, a political scientist who wrote extensively on corruption, recently noted; the number of convictions is also similar). This strongly suggests that Italy’s repression system is currently gravely inadequate. The Table below illustrates this picture. On the public opinion side of the analysis, Figure 7 below illustrates citizens’ opinions concerning some of the points mentioned above. In 1992–94 a series of investigations unveiled deeply entrenched corruption in many areas of the public sector. For example, it emerged that almost every contract made by the public agency in charge of roads during the previous two decades was tainted by corruption, through a well-organised cartel among infrastructure companies that had entirely superseded the official public procurement system. The investigations – which came to be known as ‘Mani Pulite’ (Clean Hands) – unfolded during a period of economic crisis and budget consolidation, and had political effects that remain unprecedented in post-war Europe. Besides sending much of Italy’s political establishment to trial, they provoked a wave of popular indignation that caused the sudden extinction of the five political parties that had governed the country since 1946 and led to the birth of what came to be known as the ‘Second Republic’. Elections held in 1994 marked the rise of a fresh political establishment and the emergence of a roughly bipolar political system (which recently seems to have morphed into a more complex and fluid system). In the course of the following two decades, however, corruption rose. Figure 8 shows corruption cases per 100,000 inhabitants, while figure 9 is drawn from the World Bank Institute’sWorldwide Governance Indicators and measures perceptions of corruption, which, given the characteristics of this phenomenon, are generally regarded – including by Italy’s anti-corruption agency (see this methodological study, in Italian, and this interview) – as a reasonable proxy for its actual diffusion. The two figures show specular trends of a reduction of corruption cases and a parallel improvement of the corruption indicator by the late 1990s, which was followed by a reversing of the trend thereafter. Indeed, since 2000 the gap has almost trebled, leading Italy to levels of perceived corruption typical of Eastern European middle-income transition countries. 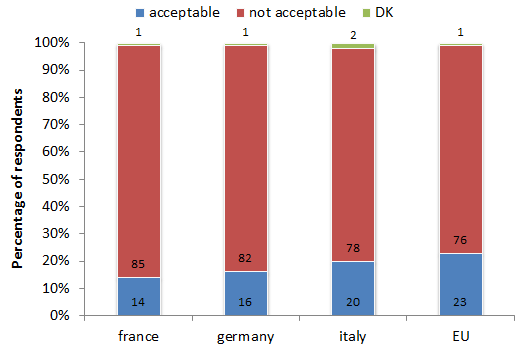 These findings are corroborated by opinion surveys, such as those conducted by Eurobarometer; by Transparency International’s latest Corruption Perceptions Index, published last December and therefore not included in the indicator shown in Figure 9, which identifies Italy as the EU’s most corrupt country, together with Bulgaria, Greece and Romania; by official reports, such as those of Italy’s supreme audit institution and of the European Commission; and by the ample anecdotal evidence offered by the corruption scandals that have dotted the past two decades. Interestingly and in line with Lipset’s hypothesis, at the regional level corruption cases are consistently more numerous in Lazio – Rome’s region – where all national ministries and agencies are located, and lowest in Emilia Romagna, the region studied in depth by Putnam (1993) for its high level of social capital. How, then, can the trend depicted by Figure 9 be explained? Control of corruption depends on several mutually influencing variables, which include slow-moving factors such as social norms on the acceptability of bribery. Among these variables are the adequacy and efficacy of the legislative instruments to repress and deter corruption, which influence the cost-benefit analysis that corruption entails: they determine the probability of being caught and the severity of the consequences. As these variables are relatively easy to measure and largely determined by political choices we shall focus on them below. The criminological and politico-economic literature shows that since 1994 Italy’s parliament has adopted a succession of laws that have had the effect – and sometimes the explicit purpose – of weakening the fight against corruption. In particular, parliament has cut the statute of limitations by half, leading many investigations to collapse or never to be opened; has complicated the procedural rules, allowing wider space for delaying tactics aimed precisely at benefiting from the statute of limitations; has restricted the means of evidence that prosecutors can employ; has effectively de-penalised certain more easily detectable crimes that are typically ancillary to corruption and can therefore signal it (the falsification of a company’s accounts, primarily, which is necessary to create the slush funds out of which bribes can be paid); and has continued the practice of entrusting large public works to private ‘general contractors’, which spend public money under feeble safeguards. This succession of laws was interrupted only in 2012, under a technocratic government, when parliament eventually passed an anti-corruption law. Yet even this law is widely regarded as weak, primarily because it failed to reverse any of the legislative choices already enacted. In parallel to this legislative policy the number of corruption investigations and convictions declined sharply, as noted above. This decline in the effectiveness of the system is probably one cause of the rise in corruption over the past two decades. And it is equally plausible that the succession of laws mentioned above is one important cause of the reduced effectiveness of the repression system. So there is very likely a causal link between those legislative choices and the rise of corruption. But, if this was their effect, why were such laws adopted and never reversed? And how could the political élite get away with it? The fight against corruption was often high on the political agenda during the past two decades. The political system that emerged after the 1992–94 investigations declared its full support for the repression of corruption and initially hailed the prosecutors conducting it. But once the leader of the main centre-right party (Silvio Berlusconi) became involved in some investigations the position of that party changed: most of the laws we mentioned above were adopted by parliamentary majorities controlled by it, especially during the 2001–6 legislature. Its centre-left opponents vehemently criticised those laws. But when they were in government they failed to reverse any of them, even adding a few equally damaging ones, and otherwise did effectively nothing to strengthen the fight against corruption. And the electorate has punished neither of the two coalitions for these choices, even though segments of public opinion vocally denounced them. The change in circumstances of a rather prominent target of the 1992–94 corruption investigations – one Gianstefano Frigerio, then a member of parliament for the party (Christian Democrats) that had governed Italy since 1946 – can serve as an illustration of this evolution. In 1992–94 four separate corruption trials were opened against him. One collapsed due to the statute of limitations, but in the other three he was found guilty. In 2001, when these convictions were confirmed in a third instance and became final, he was elected to parliament again, in the ranks of the centre-right party. He obtained a reduction of the six-year jail sentence, its conversion into social work, and the acceptance that his public service as a parliamentarian would count as social work: so he effectively served his sentence by sitting in parliament for a legislature, from which he emerged as a free citizen. In July 2014 he was arrested again, accused of having acted as a mediator – together with another veteran of the 1992–94 investigations, a former member of the main opponent of the Christian Democrats, the Communist party – in a wide corruption scheme concerning the public works for the universal exposition that opens in May in Milan (‘Expo’, whose direct cost to the public purse, narrowly defined, approaches €2 billion). This case is likely not unique and this person is still to be presumed innocent for this last episode. But if we assume, for the sake of argument, that the charges are well founded, his story seems straightforward: if he could become a legislator right after having been found guilty of corruption, and could serve his sentence by making laws for five years (including several laws weakening the repression of corruption), it is hardly surprising that he would continue a profitable practice that society and the political system evidently tolerate and that the legal system effectively failed to punish. If we move from the hypothesis that corruption is an equilibrium outcome these apparently puzzling facts find a rather simple explanation. Where corruption is systemic, rarely punished and supported by tolerant social norms, it becomes individually rational to engage in it, even though at a macro level corruption is inefficient: it is a rational choice not just for the companies and public officials that directly profit from it, but also for the ordinary citizens who resort to petty corruption to solve the everyday problems that an inefficient public administration creates. This, in turn, creates an adverse selection system in the sectors where corruption is widespread, whereby corrupt companies, civil servants and politicians prosper, whereas ‘clean’ ones are at a disadvantage and are gradually marginalised. And as these phenomena become entrenched and expand into other areas of the public sector, the combined economic, social and political power of the groups that engage in corruption rises, further reinforcing the system. So the resulting equilibrium is stable and resilient. It follows that a government that wishes to shift the country from such an equilibrium to a low-corruption one faces a difficult and long-term struggle, because the means at its direct disposal – strengthening the laws and the criminal repression system – are not sufficient: also social norms and agents’ expectations need to change. Otherwise the equilibrium will eventually absorb the shock, adjust, and re-establish itself (the personal story we just described illustrates this dynamic rather well). This, indeed, is probably what happened during the past two decades. The 1992–94 was an unplanned, episodic shock: a severe one, no doubt, but one that was not part of a deliberate, clear and credible political strategy to shift the country to a low-corruption equilibrium. And the resilience of the existing equilibrium – due not just to the social norms and individual incentives supporting it, but also to the political and economic power of the groups benefiting from it – was such that it prevented the emergence of such a strategy. 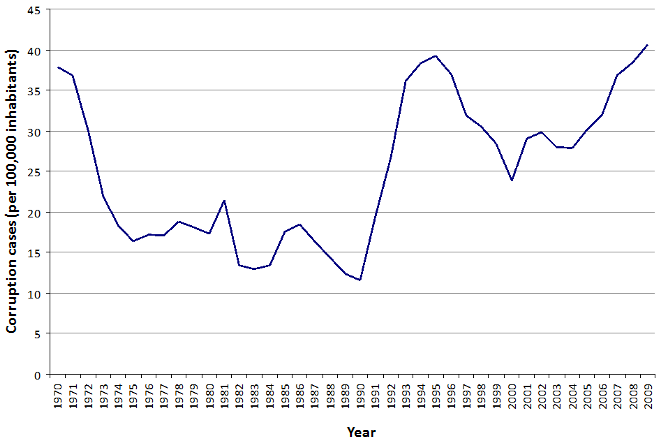 So social norms and individual incentives and expectations did not change, the shock could be absorbed, and even the governments and political forces that could have benefited from fighting corruption declined to do so: because of the difficulty of the enterprise, whose time horizon exceeds the political cycle, and because of the strength of the vested interest opposing such policies. Hence the rise of corruption measured – with a short time lag, presumably – by figures 8 and 9, for the equilibrium is not static but dynamic, and corruption is a pervasive, self-replicating phenomenon. The current parliament has been discussing a set of anti-corruption measures for more than two years. The drafts underwent successive changes, alternatively weakening and strengthening them. Besides genuine debate about the merits of these measures, this back-and-forth probably also reflects an underlying struggle between forces favouring the fight against corruption and vested interests opposing it. The current government, which relies on a broad parliamentary coalition, has not yet taken decisive action in one or the other direction. It is likely that these laws will be adopted and that they will somewhat strengthen the fight against corruption (one law on money laundering has already been approved). Yet they are unlikely to establish a truly effective prevention and repression system. Above all, the political system has not yet sent to Italian society a sufficiently credible signal that it intends to shift the country to a low-corruption equilibrium. Without such a signal it is unlikely that social norms and individual incentives and expectations will begin to change. And it is therefore likely that the existing equilibrium shall persist, despite its very harmful effects on economic productivity, public finances and social cohesion. If, as seems to be the case, the political system is unable alone to begin that shift, the reduction of corruption to physiological levels will depend on a change in social norms, which education and public debate might induce, or on pressure from the electorate. But citizens face severe collective action problems, and a spontaneous change in social norms under the existing equilibrium is a long-term prospect. It is possible, however, that assistance can also come from abroad. If it is true that Italy’s high debt-to-GDP ratio is the gravest threat to the survival of the euro (and, therefore, also of the European Union), and if it is true that corruption weighs heavily on both the numerator and the denominator of that calculation, then it ought to follow that it would be in the interest of every European to assist Italy in shifting to a low-corruption equilibrium. External pressure could therefore assist those forces, in Italian society, that seek to overcome the vested interests that impede such a shift. Combined pressure from below and from outside, within the framework of an open and reasonable public debate, might perhaps be able to achieve what the Italian political system seems now incapable of. Andrea Lorenzo Capussela has a PhD in competition policy. He served as the head of the economics unit of Kosovo’s international supervisor, the International Civilian Office, in 2008–11, and as the adviser to Moldova’s economy minister and deputy prime minister, on behalf of the EU. He is the author of State-building in Kosovo: Democracy, EU Interests and US Influence in the Balkans (I.B. Tauris: London, forthcoming) and is currently working on another book (with Vito Intini), while also conducting some voluntary work on the development of a district in Calabria, Italy’s most depressed region. Vito Intini has conducted post-graduate studies in several economic fields and has worked for different research and development institutions, in Italy and abroad. Obviously, Italy’s corruption problems are not unique. In fact, all of the civil unrest and separatist movements around the world have govt fraud and corruption at their core. After all, as Lord Acton noted, “all power corrupts, and absolute power corrupts absolutely”. What inspires frustrated people to finally move to action? Pain. Pain caused by economic hardship, that escalates as bankrupt govt’s get increasing desperate to confiscate other people’s money, which chases the capital needed for growth off the grid. In place like Greece, where the pain and corruption are peaking, as the unelected bureaucrats in Brussels impose austerity to pay their bankster donors, the govt-induced deflationary death spiral will accelerate, forcing people into the streets and the inevitable defaults by Q4 of this year. The sovereign default dominoes will not only spread to Italy, but Spain, Portugal, Ireland, and the other countries that are both bankrupt and own too much PIIG debt (i.e. France). Since the life-cycle of austerity and socialist policies are limited and predictable, the USA will get its turn at pain is coming, sooner than most understand. Corruption in the US is also peaking, as witness by the fact that Hillary and a Bush are serious candidates. As capital flees the sovereign debt crisis that will hit Europe, the dollar (and dollar-based assets and debts) will continue to rise. To avoid being criticized for blowing another stock bubble, the FED will raise rates, which will seal the fate of the US and the dollar as a world reserve, as interest expense explodes and the bond bubble pops, chasing more money into stocks and other assets backed by something tangible versus unbacked govt debt. Since US citizens will feel the pain of economic contraction for a year before the 2016 election, the establishment of both parties are toast and the Democratic party may be destroyed for at least 15-20 years. Republicans will split and 3rd-Party candidates will take more seats than anyone in the mainstream media predicts (sells). Since people’s hearing miraculously improves as the pain intensifies, an outsider will have the best opportunity since Perot got railroaded. Look our for Dr. Ben Carson.